Dr. Autumn Finley, author and assistant professor of English at Southwest Baptist University, will be the featured speaker at the SWG’s June meeting. At the meeting, Finley will discuss common grammar errors made by writers and share applicable writing styles they should use in their craft. Finley’s English education expertise is extensive. Her resume includes a Bachelor of Arts degree from Missouri State University and a Master of Arts degree at Pittsburg State University. She obtained her Doctor of Philosophy degree in eighteenth-century British literature at Oklahoma State University. 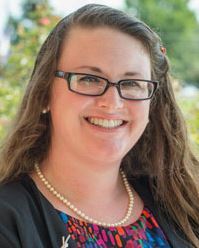 Finley recently completed her first year of teaching at Southwest Baptist University in the Department of Language and Literature where she serves as an assistant professor of English. Finley’s notable written works include: “Writing is Not a Process” – published in the 2016 paperback edition of Inquiry, Research & Argument at Oklahoma State University – and “Debunking the Mystery of 1213” published in the 2015 edition of A Guide to Writing and Research at Oklahoma State and Beyond.